Liberals won’t read to the end of this article to understand what they don’t understand. 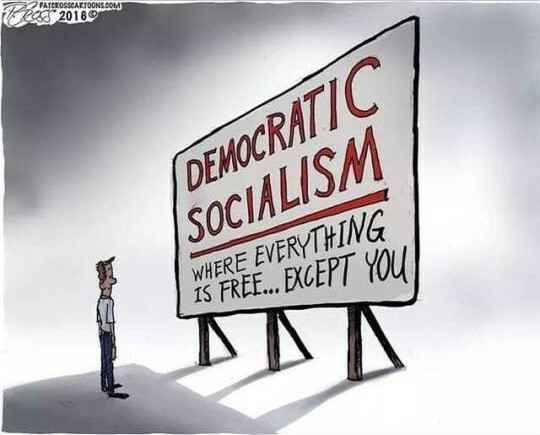 That’s why they don’t understand that when you get free sh*t from socialism that’s what you get from socialism – sh*t! Democrats are out of the closet and exposed as the socialist dictator wannabes they have always been. Destroying everything Democrats stand for needs to be the objective of Americans. Fools believe socialism means free sh*t rather than death that it has always been. Our goal should be to dismantle their indoctrination, propaganda, and voter fraud machines. Democrat’s leftist ideology is tearing down this country that has fought for freedom around the world, created more wealth, lifted more people out of poverty up to the middle class, beat back the forces of tyranny, and aided more suffering people than all other nations combined throughout history. Liberals have been indoctrinated to believe America is the evil in the world, that Christianity is bigotry, and that atheist socialism and Islam are peaceful, productive, and righteous. They can only believe this if they are so deluded that they not only disbelieve all history but ignore their own actions today. These impotent calls by Republicans for Democrat leaders to stop their violent rhetoric inciting insurrection needs to be converted to action. Democrat leaders who have told their lemmings to attack Republicans must be charged with sedition and imprisoned along with their violent fanatics. This is why socialists end up in prison and why the left then casts them as martyrs. This is how leftists create strife and then claim to be the victims. It’s the pathological lying mythomania of criminals who believe they are justified in committing crimes and when they are chastened cry out “persecution.” It is the lie of leftist victimology wherein they declare themselves innocent of the crimes they commit by blaming their victims. They are the quintessential boy who cried wolf and should get no sympathy from the righteous. Leftists constantly fool the ignorant into believing they have been unjustly treated when it is they who act criminally. The tactics of the pathological liar are to tell lies about others and then claim that others are lying about them. Like the Fake News who say Trump is the pathological liar, unless you know both sides of the story then you don’t know which is the liar and which speaks the truth. Leftists count on people’s ignorance and gullibility to confuse and delude them into disbelieving the truth. Liberals, being young and inexperienced, are more easily duped by their elder deceivers in the Democrat Party. That’s why they are now ignorant of American history and world history and have no knowledge base by which to make righteous decisions. That’s why they follow them in fascist attacks on free speech under the deluded belief they are fighting hate speech when they are actually being the fascists. It is a sickness of the liberal mind that lacks a moral compass that results in this atrocity. They are easily confused of the meaning of right and wrong by being misled over what is good and bad. Democrats would displace the Constitution that gives us our freedoms with Sharia Law or any of its other socialist institutions that take freedoms and power from the people by concentrating it in the hands of elites. Their fictitious beliefs that socialism builds wealth and is fair to all is proven false by every example throughout the world’s history, which is why they are kept ignorant. Their erroneous beliefs that they can make socialism work better than capitalism is proven to be stupid think by the results of socialism in every nation that has instituted it in the world. Believing socialism isn’t the violent, thieving, genocidal ideology it is proven a lie every day by every socialist on Earth. People build bridges to their friends, but they build walls against their enemies. Democrats have been building bridges to America’s enemies, not to make them our friends, but to make them our rulers. The Democrat’s Dream Act needs to die. Just because children were brought to America by their parents doesn’t absolve them from legal responsibility of declaring their presence and asking for citizenship. Becoming an American citizen is not a right for anyone for any reason. Anchor babies are no longer necessary to increase the U.S. workforce. They are not invading just for jobs, but to convert America into the socialist toilet they fled. America has more legal immigrants than all nations of the world combined. Why should these people who obey American law and want to become Americans be undercut by those who work against America and permit them to prosper at taxpayer expense? This is how leftists profit by stealing from others. If someone broke into your home and set up residence in one of your bedrooms does that make them family? If you kick them out are their children still entitled to stay? Democrat laws are not laws that protect American citizens. They protect criminals. Working citizens have no compassion for these invaders and shouldn’t. Democrats say these people have a right to come to America because America created evil wars in their countries endangering their lives. This is true to the extent that it is Democrats who funded and created those wars to drive those people out to seek refuge in America. Just like Obama funded the Muslim Brotherhood to create ISIS in Iraq after pulling out American troops, driving people out of the Middle East into Europe in an effort to colonize them to Islam. They want those people to transform this nation by fooling Americans forcing them to vote for socialist Democrats. The American people have no idea how stupid a mistake they made giving power over their country to a Moslem socialist to use their own money to fund their own destruction. The lesson that liberal children are not taught, and are deliberately mal-educated by leftists, is that nothing in life is free. You want “free” then go live in the desert or the mountains or on a deserted island and you can have everything God provides for you without having to pay anyone else to provide it for you. Eat berries, drink from cacti, live off the fruit of the sea. But don’t expect others to provide you with food, build you a home, teach you, or cart you about for free. Liberals have no sense of value because they are children who were never taught to work. They won’t so much as sing for their supper let alone get their hands dirty. They were raised to be deadbeats expecting entitlements by foolish hippie parents who listened to a lying leftist instructing them how to mis-parent their children. Taxes are a mystery to liberals. School isn’t free, you dolts. Your parents pay for it with their taxes. The government doesn’t provide roads and education. They are paid for by your parent’s taxes. Welfare is not charity. It is paid for by your parent’s taxes. Government is supposed to take a portion of people’s money to use for the benefits of all. Democrats take money from your parents that they earned to provide for you and give it to people who are too lazy to work for themselves. Social Security and Medicare are not free. Your parents are paying into those their whole working lives so that they have some security when they are old and can’t work anymore. Democrats are taking money from those using it to bribe deadbeats to vote for them. If you can’t see the evil in this then you are truly in darkness. Democrats have nothing to offer America except hate and violence when they are striving for power, and poverty and suffering when they achieve it. The Great Depression and Venezuela are sterling examples of what happens when Democrat leftists have great power. At least America still has the right to vote for freedom. Obama duped the people into giving him the power to manage the decline of America, but Trump is restoring this great economy by tearing down all his predecessor did to destroy it. Democrats hope for a repeat of 2006 when they convinced America that Bush was bad. But Republicans are looking for a repeat of 2002 when America united against evil. Don’t be dupes to the deceivers of the left. Learn!